Dodger Stadium awaits the Ducks and Kings. Teemu Selanne skated off the ice and walked to the visitors’ dugout at Dodger Stadium, rubbing the eye black on his cheekbones in disbelief beneath the Southern California sky. "If somebody would tell me 10 years ago that we were going to do this, I would have said they’re crazy," Selanne said. "But we have the technology to do it now, and it’s pretty great." 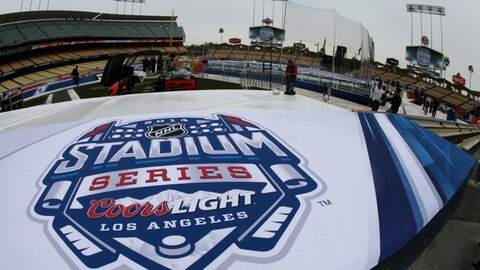 Dodger Stadium isn’t a field of dreams for many hockey players, but the Los Angeles Kings and the Anaheim Ducks are thrilled by the chance to play the NHL’s most unlikely outdoor game on Saturday. Both teams got their only practice on the ice Friday under clouds and cooler temperatures than the recent string of 80-degree days. The local rivals came away fairly impressed with the ice sheet in place for the league’s first warm-weather stadium game. Although outdoor humidity and heat are bound to cause some slush and steaminess on the ice, it’s nothing these teams can’t handle when the puck drops well after sundown. "It was a little better than I thought it was going to be," Kings defenseman Willie Mitchell said. "It’s warm, but it’s L.A. You’re going to get cooler temperatures at game time, and that’s going to help us out." Speed and slick passing could be difficult on a naturally choppy surface, but the Ducks and Kings are confident they’ll adjust to much the same challenges faced in every outdoor game — only without the snow. Los Angeles defenseman Robyn Regehr noticed he couldn’t stop sweating after the opening minutes of practice, while Anaheim goalie Jonas Hiller plans to pay special attention to hydration. "It’ll be very hot, and probably a lot of guys will be cramping up with the loss of fluids," Ducks forward Dustin Penner said. "The ice is a little sticky, sounds a little hollow, but it looks better than at other outdoor games." The game counts for two points in the standings, but the players realize they’ve also got to enjoy this improbable moment. The teams skated with friends and family after their practices while workers put the final touches on the unique accoutrements for California’s outdoor game. Ducks captain Ryan Getzlaf got his son on skates for the first time in his life — at least until he started crying inconsolably. "It’s amazing to get to play in an outdoor game, but I’m really glad I don’t have to wear a toque and mittens," said Getzlaf, who grew up playing outdoors in Saskatchewan. "Obviously, the weather is a little different than what I’m used to, but that’s great." The beach volleyball court in left field is ready, and so is the performance stage in right where Kiss will play. There’s a ball hockey court between the mound and the backstop, and a cordon of palm trees just behind the open center-field fence. "This is the crown jewel for hockey in Southern California," Ducks defenseman Ben Lovejoy said. "We both live in a great part of the world, and this will be a great showcase for how far hockey has come in this area." The boards, benches and glass were trucked in from the Winter Classic in Ann Arbor, Mich., but the ice has been built up patiently over the last 10 days. The league’s ice-making crew covered the sheet in a heat-reflecting blanket during the day and worked through the night to establish a game-worthy surface. "It’s a different feeling playing outdoors," Kings defenseman Drew Doughty said. "There are so many different aspects in the game that are going to make it more challenging for both teams — getting your legs moving, getting used to the ice, getting used to the boards. So instead of a skilled, high-paced game, I think you’re going to see a physical battle out there, and I think that’s something a lot of real hockey fans will appreciate." NHL facilities guru Dan Craig’s improbable ice sheet actually has been among the smoothest aspects of this strange chapter in the league’s expansion of its outdoor slate this season. While Southern California’s growing hockey fan base embraced the novelty of the concept, the league overpriced tickets for the event, forcing reductions to avoid the embarrassment of a non-sellout. But the hiccups likely will be forgotten when fans get a look at the ice in the middle of baseball’s third-oldest active park. "The lights are going to be different, and the glare is going to be a little different," said Kings center Anze Kopitar, who grew up playing indoors in Slovenia. "But come game time, I don’t think we’re going to be worried too much about that."